One of my favorite book designers in Sweden is called Lotta Kühlhorn. A couple of years ago she made hew own book (Designing Patterns by Lotta Kühlhorn) about her process in making repeating patterns and of course it was on my wish list ASAP! It’s now also available in English, so I thought a review would be a good start to introduce you to her and this very pretty book. Then you can decide if it’s something you want to check out. I got mine as a Christmas present under the tree… just sayin. I wanted this book a lot because it is simply a very beautifully designed book, from the cover to the layout of the pages. You know I’m a sucker for well designed books. Kühlhorn relates to patterns all the time and more than anything else. It is how she understands the world it seams. A striped pattern in her interpretation can be a graph of her sleep patterns or relationships – where a thin white line represents one thing and a thick red line something totally different. And of course, the only one who knows how to read this story is she herself! Personally I love insights into the artist mind like that. I have never thought of patterns in that way, as something with a deeper meaning than just being pretty. But of course, each element is carefully picked and relates to everything else in the repeat. Beyond the story of how Lotta Kühlhorn personally works in her studio with sketching, going back to childhood for color palettes and planning her designs – this is also a practical handbook, from an expert who really knows the ins and outs of how to design patterns – for everything from wallpaper to tea services. In the English and German version (Muster machen! ), both published by Gestalten, you’ll get an included CD that features templates for experimentation by beginners and professionals alike. I wish my book had come with that one, because it makes me curious. Let me know if you have it and used it. 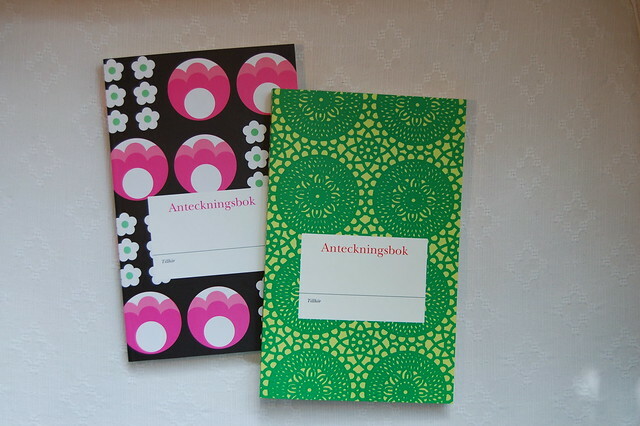 These two notebooks are designed by Lotta Kühlhorn. Photographed and bought by me in 2006. I love how she describes how simple patterns are built. For example, using different colored squares, you can make many different versions of checkered: Shepherd’s check, Gingham and Houndstooth for example. What an awesome world of patterns we live in! Kühlhorn breaks it down and makes even the simplest repeat seam cool. I just want to play with making patterns all day when I read this book! But it does not give you specific computer instructions, so you’ll need to know (or learn) Illustrator or other such software from other sources. This book is mostly for inspiration, and happy browsing if you ask me, but can also be used as a guide and a jumping of point for exploring your own ways of making patterns. I have always loved patterns but this book has been a starting of point for me, and I feel more and more drawn to trying this craft out on my own. In the end there is 10 DIY projects, describing (though not in great detail) how to make your own gift wrap, printed envelopes, patterns on fabric and more. Lotta Kühlhorn — Home Swede Home from Gestalten on Vimeo. Lotta Kühlhorn was born in 1963 and was only ten years old when she decided that she wanted to become an illustrator. Before she turned her passion into a career, she studied at Konstfack, Stockholm’s prestigious University College of Arts, Crafts, and Design. Today, Kühlhorn is a successful designer who has created book covers, editorial illustrations for magazines such as Elle, and patterns for clients including IKEA. * Interview with Lotta Kühlhorn – at the Hall of Femmes! This entry was posted in Book Reviews and tagged inspiring me, pattern design, pattern love, swedish book. Bookmark the permalink. Fin liten film. Plockade fram mitt svenska exemplar av boken, där finns ingen CD! Många fina mönster på din Pinterest. Tack för besöket Elisabet! Min är också på svenska och saknar CD:n, men det hade varit kul att få testa att leka med innehållet tycker jag.